Despite the claims of Christmas, Holy Week and Easter have always been the central moments of the Christian year. It's the week we come back again to the moment when the Creator of the world, in the person of Jesus Christ, entered the heart of the darkness of that world to rescue and redeem it - the ultimate snatching of victory from the jaws of defeat. It's also the time we remember what it means to be followers of this man. At one point Jesus used a particularly stark image to say what that means. He said we were to 'take up our cross' and follow him. 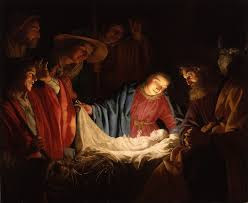 For centuries, Christians have puzzled over what that involves, but at the time, it was a dramatic picture. Urban dwellers in Roman provinces were used to the sight of condemned criminals carrying the means of their own looming deaths on their backs before undergoing the ultimate punishment. 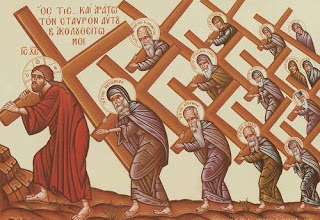 I have been thinking of how I 'take up my cross and follow Jesus' during Holy Week this year. During that dramatic final week of his life here Jerusalem, Jesus was homeless, imprisoned, an unwanted presence in a strange city, before his friends and his mother had to watch him die a slow painful death. So how do I follow Jesus during Holy Week? Many people experience these very things as part and parcel of their lives. So this Holy Week I am planning to spend the time with those experiencing much of what Jesus did. On Monday I'm spending the day in one of our London prisons, visiting those in segregation, those with physical or mental health problems, or those newly arrived in prison, and listening to how prison officers handle life in such a fraught environment. I'll be spending Tuesday with a young asylum-seeking refugee from the Congo, newly arrived in Britain, seeing what his day is like and the challenges he faces, learning English, finding shelter and a job as a stranger in a new land. Wednesday will be spent in a centre for the homeless, serving food, talking to those who come and finding out their stories, and how they ended on the streets. On Thursday I'll spend time in a children's hospice with families whose children are very ill. And Good Friday will mean walking with fellow Christians carrying the Cross through the streets of Twickenham. These are all issues our society is struggling to deal with. Our prison system is repeatedly said to be near breaking point, with overcrowded wings, and levels of drug use, mental health issues and violence at record highs. Homelessness continues to be a scandal - while we erect more and more luxury flats and house prices creep upwards again, the fact that more than a quarter of a million people in the UK do not have a home to go each night suggests we have somehow not got this right. Immigration still continues to be a political hot potato, and despite the Brexit vote, will not go away anytime soon. And while we debate the politics of it, there are real people wandering our streets, looking to find jobs, learn a strange language, struggling to get a foothold in a competitive society, all the time wondering if they will find a welcome or a cold shoulder when they come here with their dream of a better life. I don't know what the week will be like, or what I will learn. I'm not doing it because I think I can solve their problems, bring any great assistance in such a short time or even offer them great pearls of wisdom. I'm hoping to understand a bit more of what people at the tough end of our society have to face, how they cope with it and what they need to survive and thrive. I want to see first hand the sacrifices and hard work of those who do care such for such people day in and day out. Jesus once said that "whenever you did one of these things to someone overlooked or ignored, that was me—you did it to me." I have a hunch that I might find Jesus in these places too.